Based on the latest model data, there is a low risk of a bit of mixed wintry precipitation (freezing rain, sleet, or snow) in the morning between about 7-10am. We'll be watching this closely, but be aware of this during the morning rush. Most of this mix should occur southwest in the metro in AR, but it 's worth mentioning. Also, the light precipitation overnight Wednesday night, mainly after midnight, could also mix with light freezing drizzle. If this were to occur, even the veyr small amount that would occur could quickly slick up bridges and overpasses Thursday morning. Stay tuned! If you are wondering if we skipped fall and went straight to winter this year, I can't blame you. We don't typically deal with multiple snow threats in the same week in the fall. But here we are. After a brief round this morning (most of you were sleeping and missed it, but the airport officially reported light snow for one hour between 1-2am), we're looking at a more favorable setup on Wednesday into early Thursday. Typically cold air invading behind a front as precipitation moves out is not the optimal way to get much snow. The timing is rarely right for more than flurries. However, a strong upper level low moving overhead with cold air in place? Now we're talking. That is the scenario for the next 48 hours or so. See the loop below as a strengthening low pressure system (the bowling ball sporting the flaming hot Cheetos livery) as it moves basically directly overhead. So what can we expect in the Memphis metro? 1) The cold air will stick around. Temperatures remain in the 30s (mostly the lower half) through today, tonight (lows will be near 30), and tomorrow (when temperatures should get back to just above freezing for the afternoon hours). 2) A Winter Weather Advisory has been issued for the metro. This means that expected winter weather could cause significant inconvenience, but won't rise to the level required for a warning (i.e., heavy snow, sleet, or freezing rain with widespread impacts). 2) Light snow could begin as early as mid- to late-morning Wednesday. The initial stages of the precipitation should be very light as moisture is drawn north ahead of the low. There's a possibility of some light sleet or rain mixing in initially, but I'm expecting most precipitation to be snow. 3) The steadiest snow will be mid-afternoon through evening (i.e., 3-9pm or so). As the upper low moves into the area, enhanced lift will combine with the arrival of the coldest air aloft to produce steady precipitation. This is also the best chance for any accumulation. 4) Accumulation could be around an inch, perhaps more north of the city. During that window mentioned above, we could see an inch of wet snow on grassy or bare ground and exposed surfaces in the immediate metro. 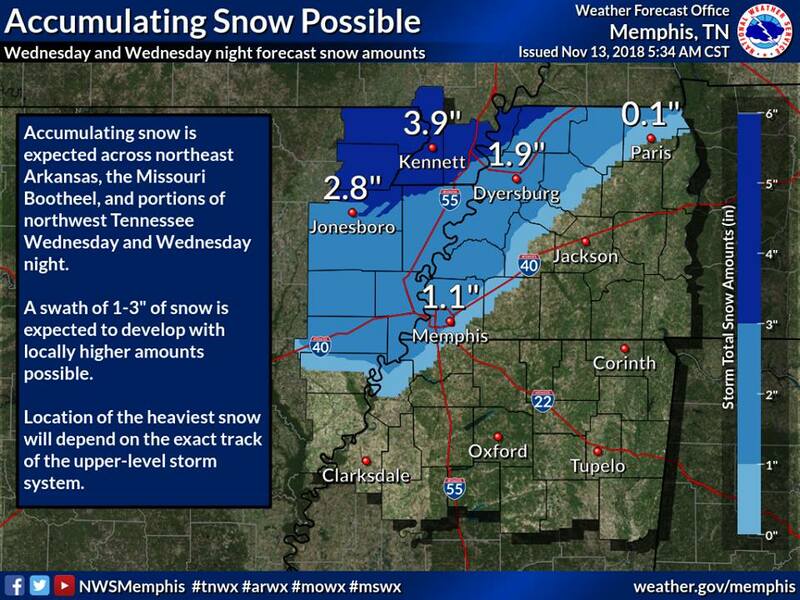 Areas just north and west, in northwest TN and northeast AR, could see a few inches of snow. The best data we have available (it's sparse in the metro) suggests that pavement and sub-surface temperatures are fairly warm still: 40s to low 50s. That should keep paved surfaces from accumulating much, if at all. I would still be cautious on the elevated roadways, especially after dark. 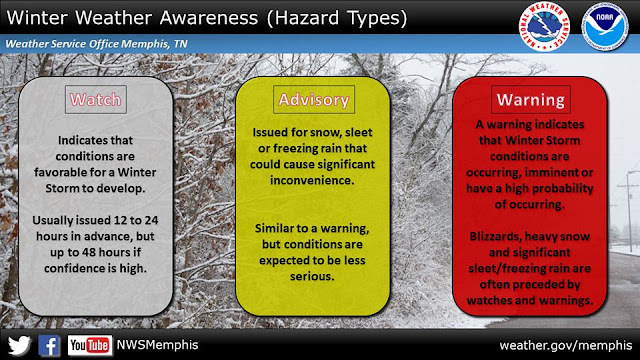 Graphic created by NWS-Memphis early Tuesday morning. This information is subject to change. 5) Light snow or flurries will continue into the overnight hours. As the low pulls by to our north, the precipitation will move north with it, leaving behind the possibility of additional very light snow or maybe just flurries overnight. No additional overnight accumulation is anticipated at this time. 6) Subfreezing temperatures early Thursday could result in some travel headaches. Depending on how much precipitation we actually receive and the wetness of the pavement, temperatures that drop to near 30 Thursday morning could result in some slick spots. We won't know that for sure this early, but keep it in the back of your mind. By mid-morning, temperatures should be back above freezing. 7) Warmer days are ahead! Highs Saturday could reach 60°. 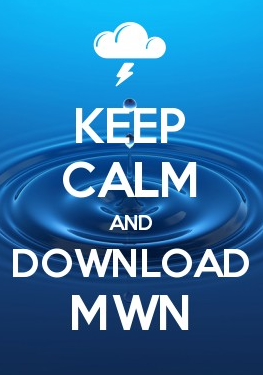 We'll have the latest information on our social media channels throughout the event and of course the MWN Forecast will also have the latest official forecast from us. Links are below. Plan ahead, stay safe, and I'll get back to working on patching the #SnowDome.